DO-31413-14 was succesfully added to your cart. 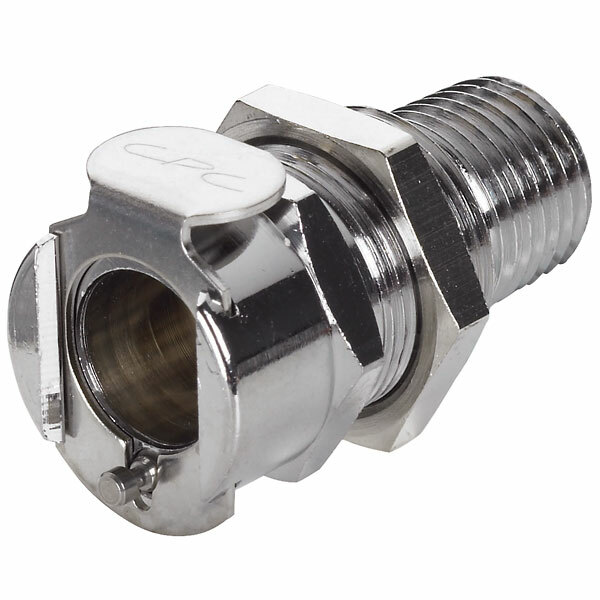 New quick-disconnect fittings consist of two fitting halves—order coupling bodies (female halves) and inserts (male halves) separately. Fittings withstand pressures from vacuum to 250 psi, temperatures from –40deg to 180degF (–40deg to 82degC). Made of chrome-plated brass with stainless steel springs and latch. Valved fittings have DELRIN® acetal shutoff valves that seal the flow path when fitting halves are disconnected.One of Colder Products' original lines, these quick-disconnect couplings are available with two different flow sizes. Couplings are made of chrome-plated brass and withstand pressures from vacuum to 250 psi and temperatures from –40 to 180°F(–40 to 82°C). Coupligns are suitable for pressure or vacuum applications as well as liquid transfer. All couplings are chrome-plated brass with stainless steel springs and latch. Valved fittings have acetal shutoff valves to seal the flow path when disconnected. To make a complete coupling, order bodies and inserts with same flow sizes separately below.